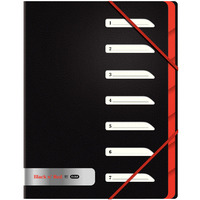 Black n Red A4 L Folder (Pack of 5) 400051533 Pack of 5 Stylish and professional L folder from Black n' Red. Store and transport loose sheets of paper. Hard-wearing, wipe clean polypropylene. 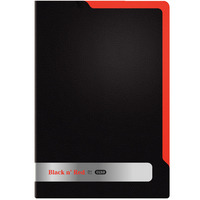 Pack of 5 folders..
Black n Red A4 7 Part Sorter 400051534 Pack of 1 Stylish and professional 7 part sorter from the executive Black n' Red range. Tabbed on each section. Elasticated closure for security. Numbered spaces on front for easy referencing.